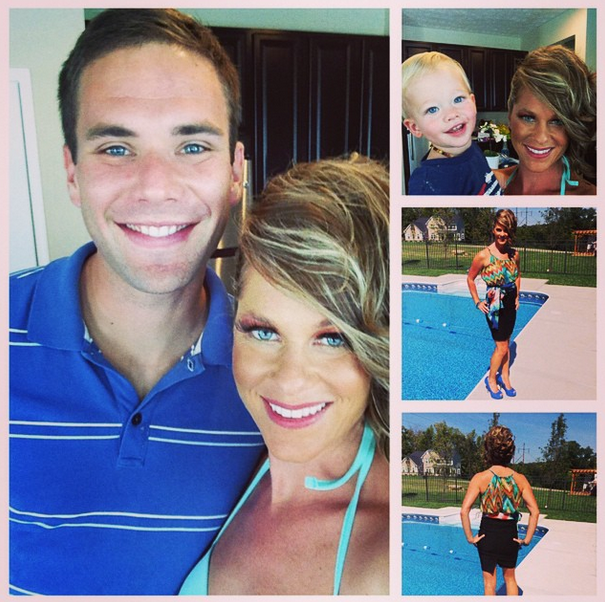 Fit mom goes fashion mom — getting out of my comfort zone. Have you been out of your comfort zone recently? I have! Last week my good friend asked me if I was busy on Friday morning. I said I was available, and a few minutes later, I had somehow volunteered to walk down a runway in a hair/fashion show. I’m always up for a new adventure, but wow, this was out of my comfort zone. J and I shopped this past Wednesday night for an outfit that I could wear for the show. While the outfit we picked was a little more edgy that my usual attire, it wasn’t terribly uncomfortable. But then we had to pick the shoes. Holy moly, I have a terrible time walking in extremely high heels. The first pair I could literally not walk in at all, so we picked a blue pair of peek toe shoes with 5 inch heels that were a little more bearable. I showed up to J’s salon pretty early on Friday morning. He did my hair and makeup. This was the FIRST time in my life that I’ve had fake eyelashes, a full face of foundation, and the whole works. I got dressed and we started driving to the show. J’s salon manager was with us and just happened to mention that most of the models had done a walk through the previous night. What?! So, this is my first time to ever walk in high heels, with lashes, down a runway, and everyone else has already practiced? GREAT — LOL. We walked into the model room at the show facility, and oh my goodness. I have never seen anything like it. The models were all decked out in crazy outfits with unbelievable wigs, and even crazier personalities. To say I was out of my comfort zone is the understatement of the year. All of us models lined up to walk down the runway in front of a packed room of socialites from my area. I was literally “shaking in my heels.” I watched as professional models walked in front of me down the runway and back. Then it was my turn. I walked (carefully) up the runway steps … waited for my music to come on … and owned it. I figured, there’s no turning back now — may as well go “all-in.” J had coached me on a hip curl, proper strides, how to hold my shoulders, etc. I did the best I could and had a blast. I even walked down a second time because the music was still going and it was so fun the first time, HAHA! So, why do I share this? The fashion show — while totally out of my comfort zone, was a ton of fun, and I’m soooo glad I have memories from this event. It is always scary to try something new, but always worth it! How can you step out of your comfort zone this week? Maybe you should join a new group or try a new sport. Perhaps it’s time to sign up for your first race, or consider a figure competition. I challenge you – Do ONE thing that scares you every day this week. You ROCKED the fashion show(I’m sure of it)! You are one brave and ALWAYS positive mom! I nominated you for a Very Inspiring Blogger Award- of which you are very deserving!